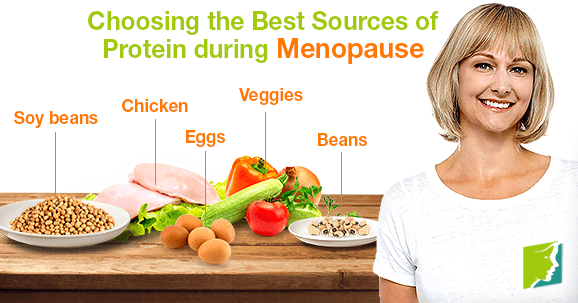 Choose the best sources of protein during menopause.If you're experiencing menopausal weight gain, you may be one of the many women searching for dietary remedies. Protein is a valuable nutrient found in certain foods that can help lessen the effects of menopause such as weight gain and bloating. Generally, consuming 46 grams of protein each day can help alleviate such symptoms. However, consuming the right foods to meet your daily protein requirements can be tricky. While you're maximizing your consumption of protein-yielding foods, such as meat, you also want to make sure you're not increasing your fat and cholesterol intake. Protein primarily comes from living organisms-plants and animals.Protein primarily comes from living organisms - plants and animals. Plant-based protein is mainly found in legumes, or beans and peas, and nuts. These food sources also contain phytoestrogens that help ease the effects of hormonal fluctuations in the body. Of this group, the soy bean is the most protein-dense, containing approximately 40% protein by weight compared with the 20% found in most other beans. However, if you choose to make soy one of your sources of protein, be cautious. Some studies indicate that soy can possibly increase a woman's chance of breast cancer. When you shop for soy in the grocery store, search for soy products that have not been chemically changed. Soy beans and tofu are natural sources of soy. Meat-based protein is perhaps the most common dietary contribution.It is perhaps the most common dietary contribution you will find. For maximum benefit, try to consume at least one serving of meat with every meal. To be healthy, limit your consumption of red meat, which is often high in fat and cholesterol. Prepare egg whites and turkey bacon for breakfast instead of having the whole egg and pork bacon. Have a grilled chicken breast for lunch instead of springing for a greasy hamburger. And try to include a serving of baked fish and veggies in your nighttime meal. Eating a balanced diet which includes protein during menopause can help lessen some of the symptoms of this transitional period, including hot flashes, abdominal weight gain, and vaginal dryness. Click on the following link to learn more about the different treatments for weight gain.